When planning a break from the grind of everyday work and living, Hawaii is probably one of the first places that comes to mind. It is also a popular wedding and honeymoon destination that has welcomed as many as 1/3 of all U.S. newlyweds in recent years. However, in the islands, relaxation and romance are not mutually exclusive. Simply trying to "get away from it all" may turn into that beautifully romantic experience of a lifetime. And, the slower pace of the islands surely will help relax a wedding party, and later, the honeymooners. A favorite destination for those who want an intimate, easygoing vacation is the Garden Isle of Kauai. From the moment visitors deplane at friendly Lihue, they are greeted with gentle sea breezes and the fragrance of flowers. There, the relaxation begins. Traffic moves slowly along the narrow roads. People smile at one another as they saunter through shopping areas. If one doesn't immediately embrace the casual pace, they've missed the point of the Kauai experience. One of the most beautiful locations on Kauai is Poipu Beach, located along the sunny, southern shore. It is a very popular wedding and honeymoon destination. Situated in the heart of Poipu Beach is Kiahuna Plantation Resort, a sentimental favorite of relaxation-minded vacationers who return year after year to its golden shores. The resort, built in 1970 with extensive remodeling since, has maintained the original 1930's sugar plantation style and architecture in its gracious condominium buildings. 35 acres of sweeping lawns, koi ponds and the lush Moir Gardens carry visitors toward the low-bank beach and calm, clear ocean, where tropical fish and turtles delight snorkelers. A stroll along the boardwalks, a stop at the Poipu Beach Athletic Club, a snack at the beach hut, a game of volleyball, surf lessons, shopping, 5-star restaurants and free wireless on The Great Lawn, all provide the ultimate vacation and are within a 5 minute walk of the condos. Golfing is just a mile away. A great advantage of vacationing in resort condos such as Kiahuna Plantation Resort is the option to rent directly from the condominium owners. A quick online search reveals that many of the owners provide websites with photos and extensive descriptions of their condos. When looking for the perfect escape, or a romantic getaway, it's a bonus to know that the destination won't be a mystery. Renting directly from the owners is especially advantageous when a wedding is involved. There is a cost savings and, with a little planning, families can stay near one another, yet not be lined up down the hallway of an impersonal motel. Because of its intimate setting, Kiahuna Plantation Resort is an ideal location for weddings, honeymooners and romance-minded vacationers. Condos are situated with privacy in mind. Yet, there are picnic tables and barbecue facilities available on the edge of The Great Lawn that can accommodate grilling for two, or a family gathering. The well-appointed kitchens make dining-in very appealing. A quick drive up to one of the quaint Koloa groceries can provide the ingredients for a romantic dinner "at home". Fresh flowers for your table, and an amazing diversity of produce are available at the Koloa Farmers Market. Wedding planners and caterers are available on Kauai for anyone wishing to be married or renew their vows there. As well as Kiahuna Plantation Resort, there are several other Poipu Beach areas that provide a lovely backdrop for a island wedding. If your tastes run to a "4-diamond" experience, the Grand Hyatt Kauai Resort and Spa provides excellent wedding services. 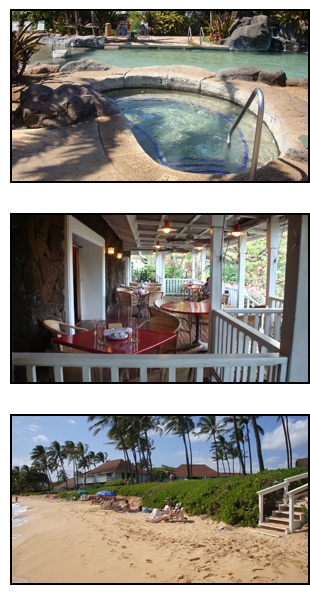 If quaint and small are a preference, Hale Pohaku is just a short distance from the beach. Other resorts in the area who provide wedding venues are Sheraton Kauai Resort and Whaler's Cove Resort. When day-dreams are filled with tropical breezes, floating in calm seas, and toasting a loved one at sunset, it's time to book a vacation to Kauai. For the most romantic, tranquil getaways, experience a few days in Poipu Beach. You'll love it, and you'll be back. Please contact us for more information regarding our direct owner condo rental at Kiahuna Plantation in Kauai.